Flavonols are a type of Flavonoids which is a powerful Antioxidant and have been associated with lowering the risk of hypertension, coronary heart disease and lowers LDL the bad cholesterol. 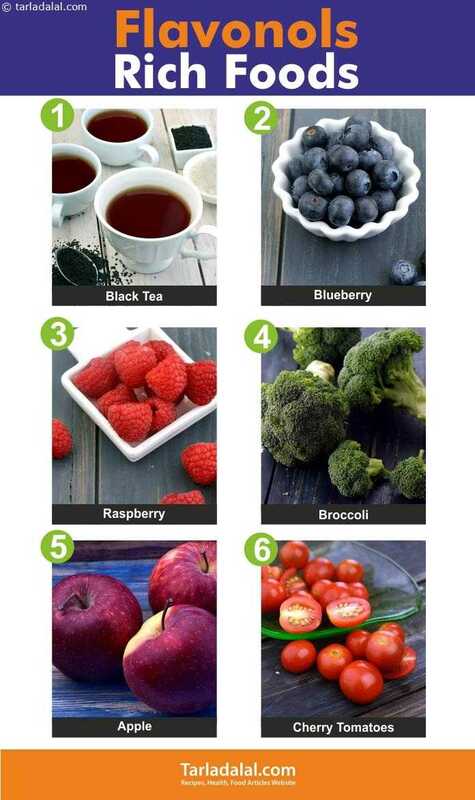 Flavonols is the most common type of Flavonoids found in foods. The 3 different flavonols are quercetin, kaempferol and myricetin. Amongst these 3 quercetin is the most potent flavonols and beneficial to us. 1. Works as an antioxidant and protects the body’s healthy cells against stress, cigarette smoking and environmental pollutants. 2. Reduces the dangerous inflammation of the arteries. The flavonols found in unsweetened cocoa and chocolate are the most beneficial for this. 3. Flavonols, especially those found in onions, slashes the chances of different types of cancer. 4. Decreases heart diseases and improves coronary artery function. 5. Protects the nerves from oxidative damage and strengthens the nervous system. Some amount of flavonols are definitely lost upon storing the ingredients for a long time or cooking them for a long time. To get the full benefit of flavonols just chop them fresh and toss into a salad or a healthy shake. Try recipes from our repertoire like Citrus Kale Apple and Feta Salad, Strawberry Almond Milk and Oats Smoothie, Blueberry Avocado Vegan Smoothie etc. If the ingredient losses it’s colour upon cooking, it’s an indication that some amount of flavonols is lost. However occasional indulgence into soups like Broccoli Broth, Broccoli and Bajra Snack is not unhealthy. You are sure to be benefit from that little flavonol content too.